Scoliosis generally develops during childhood. The terms pediatric and childhood here refer to patients who have not completed their growth (i.e., they have not finished going through puberty and are often under the age of 18). Pediatric scoliosis is distinctive from adult scoliosis in terms of the causes. In addition, the goals of treatment differ in skeletally immature patients. Scoliosis is a musculoskeletal disorder that adversely affects the shape of the spine (backbone). 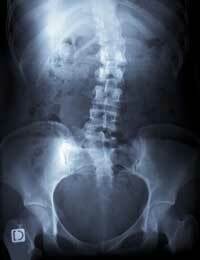 The spine is composed of bones called vertebrae. Normally, when viewed from behind, these bones (vertebrae) run down the back in a straight line. There are normal (front-to-back) curves of the spine; however, scoliosis is a side-to-side curvature of the spine. Therefore, a scoliotic spine (when viewed from behind) will not be straight and may instead look like the letter "C" or "S", due to the side-to-side (right-to-left) curvature. An abnormal curvature of the spine can occur at any age and from a variety of causes. Therefore, pediatric scoliosis can be divided into a number of different classifications, each with its own unique features and type of treatment. Idiopathic scoliosis is the most common type of scoliosis; approximately 80% of individuals with scoliosis are considered idiopathic. Idiopathic simply means of unknown origin; therefore, idiopathic scoliosis means that the exact cause of scoliosis is not known (i.e., there is no clear cause). Infantile Idiopathic Scoliosis: idiopathic scoliosis affecting children from birth to 3 years of age. Juvenile Idiopathic Scoliosis: idiopathic scoliosis affecting children from 3 to 9 years of age. Adolescent Idiopathic Scoliosis: idiopathic scoliosis affecting children from 10 years of age until skeletal maturity (approximately 18 years of age). This is the most common type (approximately 80%) of pediatric scoliosis and occurs more often in girls than boys. Neuromuscular scoliosis is caused by diseases that adversely affect nerve and muscle function. Muscular dystrophy, polio, cerebral palsy, and spina bifida are examples of neurological conditions that affect muscles and can lead to the development of scoliosis. Congenital scoliosis is present at birth; the abnormal curvature of the spine occurs before birth, during development. Congenital scoliosis can be the result of improperly formed vertebrae and/or ribs. Besides the types listed above, scoliosis can also be classified as either nonstructural (functional) scoliosis or structural scoliosis. Nonstructural (functional) scoliosis is a temporary abnormal curvature of the spine. It is the result of conditions like muscle spasms, differences in leg length, or inflammatory conditions. Structural scoliosis is an abnormal curvature of the spine that is not temporary (i.e., it’s fixed). This type of scoliosis can be the result of neuromuscular diseases, birth defects, metabolic diseases, tumors, connective tissue disorders, injury, rheumatic diseases, or unknown causes (idiopathic scoliosis). Although children of all ages can develop scoliosis, onset primarily occurs between 10-15 years of age. For adolescents with scoliosis, curvatures generally get worse during a growth spurt. Scoliosis has shown a tendency to run in families; it is estimated that approximately 30% of pediatric scoliosis patients have a family history of scoliosis. Statistics vary as to the percentage of school age children affected by pediatric scoliosis, it is thought to be somewhere between 2-5%. However, only a fraction of these patients develop abnormal curves large enough to require active treatment.